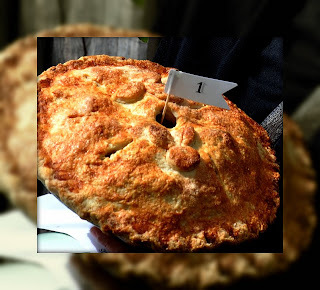 Sweet Sadie's Baking: Chudleigh’s Piefest –1st in Crust and 2nd Overall! Chudleigh’s Piefest –1st in Crust and 2nd Overall! I am so excited!!!! I won for Best Crust and 2nd for overall pie. I am so happy I won for best crust because the crust can be a very difficult component of the pie and has always been a challenge for me. 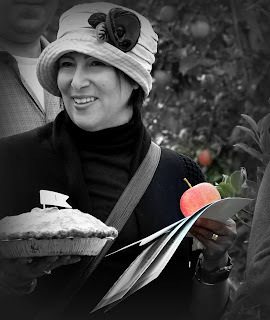 We had a great day at Chudleigh’s with hayrides and apple picking…ribs and corn for lunch and of course the pie contest. 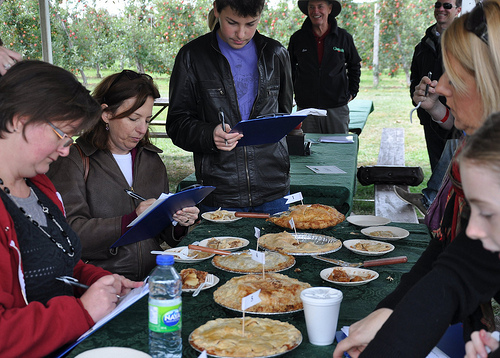 There were about 8 judges and it was quite tense as they sampled the pies – the crust – the filling and the combination. When they presented the awards, I was thrilled. I would like to thank my friends for coming out and supporting me- it was so much more fun because you were there – Meredith, Dan, Jacob, Jeremy, Anne and Sally! And thank you Dan and Meredith for helping me peel and core the apples the night before. Because this pie was baked during the apple picking season, we had a variety of types of apples to choose from. I chose Ginger Gold and Red Cortland that I bought from my local market. My goal was to bring out the flavour of the apples and not mask the taste. Even a little flour or cornstarch or potato starch, that some people to thicken the juices, can reduce the flavour of the apples. If I was baking the pie in the middle of winter, I would probably have made it with a combination of Macintosh and Granny Smith’s (more readily available) and maybe even added cream. My son Elliot loves my sour cream apple pie! This is the recipe I used for the pie contest! Pulse (three 1-second bursts) flour, salt, and sugar in a food processor work bowl fitted with the steel blade. Add butter and pulse to mix in five 1-second bursts. Add shortening and continue pulsing until it resembles coarse cornmeal, four or five more 1-second pulses. Turn mixture into medium bowl. Sprinkle 8 tablespoons ice water over mixture. With blade of rubber spatula, use folding motion to mix. Press down on dough with broad side of spatula until dough sticks together, adding up to 2 tablespoons more ice water if dough will not hold together. 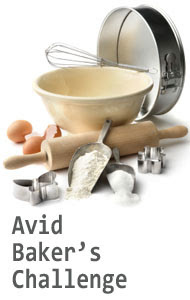 Squeeze dough gently until cohesive and divide into two equal balls. Flatten each into a 4-inch-wide disk. Dust lightly with flour, wrap separately in plastic, and refrigerate at least 30 minutes, or up to 2 days, before rolling. Combine 3/4 cup sugar, lemon zest, salt, allspice, cloves and cinnamon in small bowl. 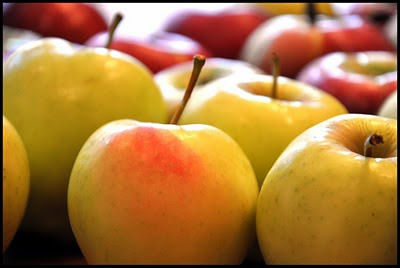 Peel, core, and cut apples into 1/2-to-3/4-inch slices and toss with lemon juice, then add sugar mixture and toss well. Let sit for 30 minutes. Drain and boil juices with 2 tbsp butter for 5 minutes to reduce. 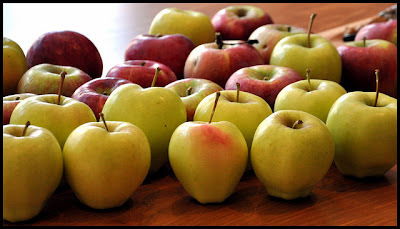 Pour 1/3 cup of these juices back over apples. Remove dough from refrigerator. If stiff and very cold, let stand until dough is cool but malleable. We will be placing the pie on the floor of the oven so if you have a pizza stone, you can place it on the floor of the oven or cover the bottom with foil to catch the pie juices so it doesn't make a mess. Heat oven to 500 degrees. Roll one dough disk on a lightly floured parchment paper into a 12-inch circle. Rest this parchment paper on a cookie sheet. Roll 2nd dough disk on a lightly floured parchment paper into a 13-inch circle. Rest this parchment paper on top of first pie disk. Cover with plastic and place this cookie sheet in the refrigerator until you are ready to assemble pie. Gently press dough into sides of 9” pie pan (glass, foil, tin) leaving portion that overhangs lip of pie plate in place. Turn fruit mixture, including juices, into chilled pie shell and mound slightly in center. Place next dough round over filling. Trim top and bottom edges to 1/2 inch beyond pan lip. Tuck this rim of dough underneath itself so that folded edge is flush with pan lip. Flute edging or press with fork tines to seal. Make 1 medium sized hole in the top crust in the center of pie. Cut four slits at right angles on dough top. Brush egg white onto top of crust and sprinkle evenly with remaining 1 tablespoon sugar, (omit if freezing unbaked pie, see below). Reduce the oven to 425 degrees. Place pie on floor of oven or on pizza stone. (you can also preheat a cookie sheet and place the pie on that) Bake until top crust is golden, about 25 minutes. Reduce oven temperature to 375 degrees; continue baking until juices bubble and crust is deep golden brown, 30 to 35 minutes longer. Transfer pie to wire rack; cool to almost room temperature, at least 4 hours. 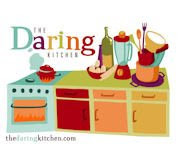 · Do-Ahead: Freeze the unbaked pie for two to three hours, then cover it with a double layer of plastic wrap, and return it to the freezer for no more than two weeks. To bake, remove the pie from the freezer, brush it with the egg wash, sprinkle with sugar, and place directly into a preheated 425 degree oven. After baking it for the usual fifty-five minutes, reduce the oven to 325 degrees, cover the pie with foil so as not to overcook the crust, and bake for an additional twenty to twenty-five minutes. IIf you have any questions, please email me at pennymartin1@gmail.com! The best apple pie I've ever had. Camera Guy said.....Today Chudleigh's....tomorrow THE WORLD! I'm proud of you honey!